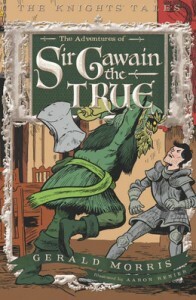 In this series, he takes some of the same King Arthur legends, but reworks them for a younger audience. I was delighted with how easily I could read this children’s book cover to cover, and enjoy both the writing and the message. Morris has a great sense of humor, and modernizes his retelling of King Arthur in a way that allows today’s children to access it. He also emphasizes the goodness rather than the gory. For example, in the Gawain story, it’s all about courtesy. I discovered some explanation for Morris’s skill when I found out he is a pastor. He writes children’s books to support himself, and also uses them as a lovely platform for uplifting, and not heavy handed, transmission of values. A nice combination. I could imagine reading this children’s book aloud to younger children (5 or 6) but since there is a bit of head-chopping (not real but attempted), it might be better to wait till they are older and can see that it was written in jest. However, if you have a young boy interested in knights, and don’t want to wait for him to grow into the older series, the Knights’ Tales are a great place to start.